Sydney Shop Girl: The Show Must Go On. As planned, Sunday has been a slowish day doing all those little things that make the day go by in a relaxed manner. 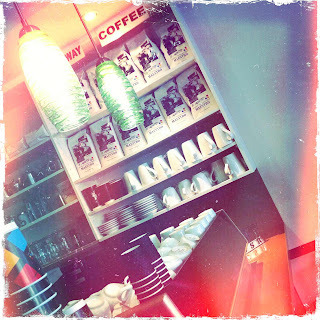 There was my regular pit stop for coffee before church this morning. And my blueberry muffin for breakfast. I must have eaten my body weight in blueberries already this year (so cheap!!) 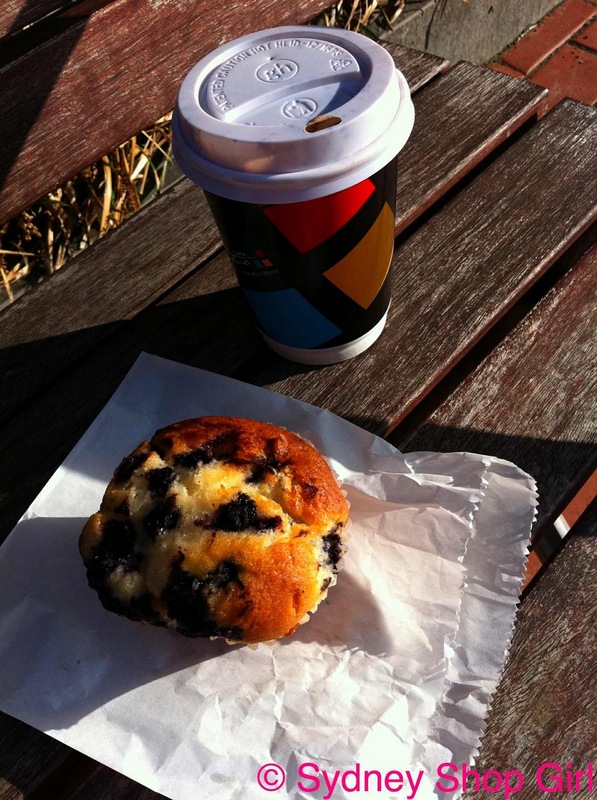 but that didn't stop the sudden craving I had for a blueberry muffin this morning. Sure, I could have made them from scratch with the fantastic blueberries we bought this weekend but today's watch word is 'lazy' so I couldn't very well go and be too industrious today, could I? I'm getting to that stage in my life where not everything I see in stores is age appropriate. A few years ago, I would have just bought these hair clips to celebrate my new short 'do. But today, I had this prolonged internal dialogue about whether a woman in her mid thirties can (or should) wear perky bows on a side part. I decided to leave the bows at Diva ... and wait for more feathered head pieces instead. For my Royal Wedding ensemble, of course. I think it was this whole 'dress your age' dogma that resulted me not buying anything from any of the stores I visited today (Supre, Country Road, Forever New and Forcast). Artful ruching and impossibly long sleeves and legs are a great idea but don't translate well to real life for a person of average height and limb to trunk length ratios (let's not talk about hips). Also, there really are so many pairs of leggings, jeggings and skinny jeans a person can own. OPI's The Show Must Go On. It was a Mulberry Bayswater kind of day today. The Show Must Go On though. I finally got to try out this OPI nail polish I bought last year. I don't think there's an age limit to shimmer in nail polish. I achieved a minor victory in the garden today. 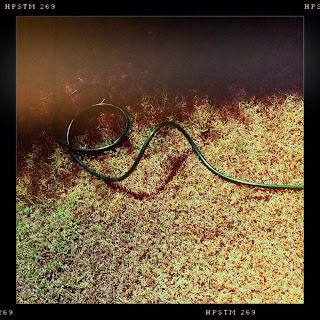 I managed to connect all the attachments to the new hose and water the garden without drowning myself or the visiting neighbourhood cats. Those adaptor ends really should come with instructions but I finally got there with a bit of trial and error. Mr SSG and I ended the day with a swim in our local outdoor pool. 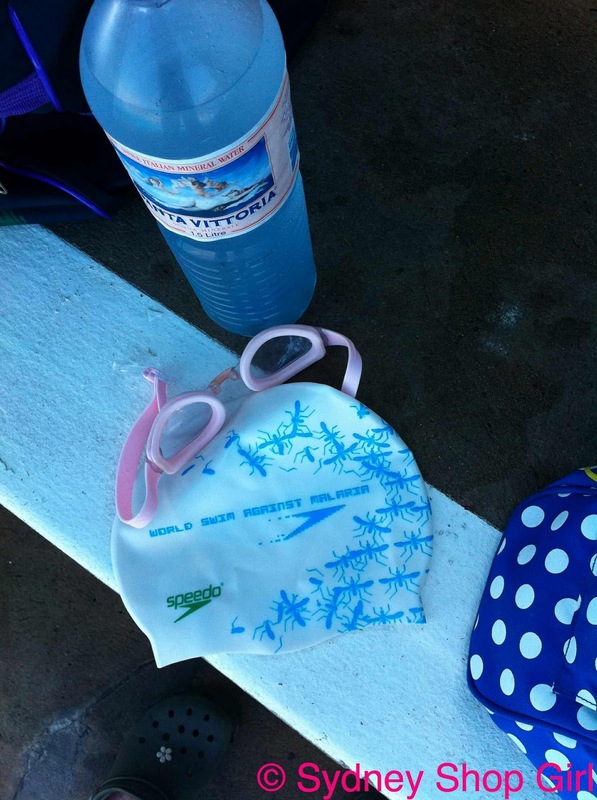 To add some holiday vibe to our time in the lap pool, Mr SSG brought along a fancy bottle of Italian still water. Which I co-ordinated with my goggles and swimming cap. What a chic life. The news about Japan continues to get worse and worse. Can this planet cope with any more senseless destruction and loss of inoccent lives? The most haunting images to me have been those of the military rescue teams carrying the young and elderly out from the rubble. And then there were the interviews and footage of the Japanese search and rescue team flying home from New Zealand where they've been assisting for the last few weeks to return home to do it all again in their home country. The nuclear power plant story just tips the already tragic consequences of the earthquake into a disaster whose severity no words, figures or news report can fully quantify. The show must go on for those still alive and the hope that those whose whereabouts are currently unknown are still alive. I have opted for some chic bow hair accessories from Mimco. I have a bow headband and two clips - minimal and pretty. And age appropriate for me, probably you too. I always buy headbands from Ebay though - much cheaper. Clips on sale. It is so sad about Japan. Its senseless, and on a huge scale. I want to write about it but can't find the words. I thought I posted a comment, but it didn't work? 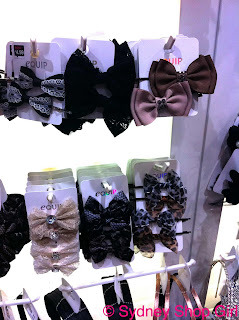 I said that I wear bow hair accessories from Mimco - headbands bought on Ebay and clips from store on sale. Age appropriate and chic and minimal. I also am so sad about Japan. It's devastating. Japan. I have no words. The situation breaks my heart. SO glad you stated "I don't think there's an age limit to shimmer in nail polish". After reading on the Vogue Forums that a poster believed all bright polish should be banished at the age of thirty I was both appalled and disappointed. Why the heck shouldn't I continue to wear bright polish!? I know that the show must go on...but my heart is heavy for those in Japan. It's 6am and looking at your coffee just gave me a huge caffeine craving! Love your swimming gear, I saw the pic before I read it and thought wow that is really chic swimming stuff. The footage of Japan is horrific, watching these disasters and loss of life is so sad. The news from Japan is horrible. I honestly wonder what's happening to the world at the moment. Such devastation and sadness. I see things like that now, that I wouldn't wear. I'm barely 21. But nail polish is forever, brights or shimmers or glitters. It's all good! I always love making my own muffins, for some reason I don't like blueberry muffins though lol. Never could eat blueberry things, even though I quite like them. Strange, I guess.